There’s Still Time to See the Dentist Before School Starts! Summer seems to have flown by, and those lazy days are quickly being replaced with the back to school rush. Your child needs supplies, clothes, and…you always forget something. What could it be? Ah yes, a trip to the dentist! A quick checkup and cleaning is a great idea before school starts, and today, we’re going to give you 3 reasons why. 1. You’re about to get BUSY! The school year is busy for children and parents alike. Your child will be occupied with classes and homework, and you’ll be busy driving them to various extracurricular activities and “study groups” with friends. It’s amazing how your day just melts away. It can be tough to find time to do anything else. Rather than having to wait for a Saturday appointment or have your child miss school, why not schedule a checkup while you still have a few open days left? These appointments are quick, and you won’t have to feel rushed. It’ll be just one less thing you need to worry about when school is back in full swing. 2. It’ll help your child in school. How so? According to the CDC, about 23% of children aged 2-11 currently have an untreated cavity. For school aged children, this not only means they need to go to the dentist, but it also means they may be dealing with dental pain. If you’ve ever had a toothache, you know how distracting it can be, which is the last thing you want your child to deal with while they’re trying to learn. 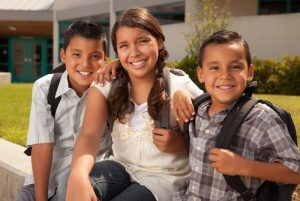 Every year, children across the U.S. miss thousands of days of school because they need to get a dental problem fixed. By bringing your child to your family dentist before classes start, you’ll have time to take care of any potential dental problems they might have so they don’t throw off their school year. 3. It can help your child’s confidence. When it comes to children, self-confidence gets spoken of a lot, and for good reason. Self-confidence, in addition to making your child feel good about themselves, is also tied directly to their school performance. In short, a confident child will do better in school simply because they believe they can, creating a powerful self-fulfilling prophesy. What’s an easy way to boost your child’s confidence? You can make sure they have a clean, healthy, and beautiful smile. No matter the age, the appearance of the smile can really affect how a person feels about themselves, and if your child is always eager to smile because they’re proud of their pearly whites, you’ll see that they’ll have a much better experience in school both socially and academically. School is just around the corner, but there’s still time to schedule a last minute checkup and cleaning! It’s one of the simplest and most effective things you can do to help your child get a strong start, and with that, the rest of the year should be nice and easy! Dr. Shweta Sinha is a general, cosmetic, and children’s dentist based near Keller, TX. She has years of experience treating little smiles, and she loves the look on her youngest patients’ faces when they see their freshly cleaned teeth after an appointment. She currently practices at Smile: Refined, and she can be reached through her website or by phone at (817) 431-6400. Comments Off on There’s Still Time to See the Dentist Before School Starts!